Early in the reign of Emperor Yang, the peasant/poet Chen Hsi-wei was making his way through Jizhou. He had no particular destination but thought he might visit the city of Dingxiang. It was a wet November. Hsi-wei was drenched and cold and a long way from the prefectural capital when he found shelter with a peasant family. Like so many families Hsi-wei encountered on his travels, the Huans were missing men, both a father and an uncle. Though he knew what she would say, Hsi-wei felt it proper to give Mrs. Huan a chance to speak about what concerned her most. He asked after her husband. Mrs. Huan scoffed, gave a shrug. “So you hide from the roving conscription gangs—the ones that aren’t so ‘methodical’?” asked Bao. Bao was entitled to be proud of how they had managed. Though it was not growing season, Hsi-wei could see that the land had been well tended. The house was in need of some repairs and paint, but it was neat, the floors swept and washed. When he arrived at their door in the late afternoon, tired and wet, Mrs. Huan looked at Hsi-wei almost fearfully. Her daughters stood behind her, Mei expectant, Bao looking almost put out. Mrs. Huan became less suspicious when he told her their elderly neighbor, Mr. Chen, with whom he happened to share a family name, had directed him to her. “Mr. Chen said he regretted he had nothing suitable for me and suggested you might be able to put me up for the night,” explained the poet. He offered to make Mrs. Huan, Bao, and Mei fine straw sandals if they could spare a corner for him to sleep in, and perhaps a little rice with a vegetable or two, a small cup of tea. “I think we can do that,” said Mrs. Huan. Hsi-wei bowed, thanked her, and said he’d noticed a broken barrow by the door. He offered to fix it. “We’d prefer help with the roof,” said practical Bao, pointing up to a damp spot on the ceiling. Emperor Wen initiated vast projects, restoring and extending the Great Wall and digging the Grand Canal. He had begun wars to secure and extend the Empire. He raised taxes; the peasants could pay in kind, with labor, or military service. Staggering numbers died at the works and in the wars. The people grumbled and, here and there, rebelled. However, when they considered all the good Wendi had done, for the most part they submitted. And Emperor Wen did accomplish a great deal, beginning with the reunification of the country after three centuries of disorder. He reformed the state’s antiquated and corrupt administration. He simplified the Empire’s political structure and re-allocated land in a way that was more fair and productive. For the first time in memory, the cities had surpluses of food. Wendi brought back the examination system and centralized all government appointments, at once raising the quality of the civil service and freeing people from the system of nepotism under which officials were drawn from the richest, best connected local families. Wendi’s first reform was to replace the system of traditional punishments—which included dismemberment and even the execution of three generations of a criminal’s family—with the humane Kaihuang Code. His second was to standardize the currency by minting new Wu Zhu coins to replace the old private and local currencies. Emperor Wen was succeeded by his tyrannical, sybaritic, and vicious son, the Emperor Yang who, according to rumor, assassinated his father. In his travels, Hsi-wei observed how conditions worsened under Yangdi. Taxes were further increased and with them conscription. Millions lay under the Great Wall; and more than half the workers sent to the Grand Canal died by drowning, mudslide, exhaustion, hunger, or exposure. The new Emperor’s military ambitions exceeded even his father’s. He sent vast armies to invade Champa in the south and Goguryeo in the north. All these campaigns failed with colossal losses. Like many others, Hsi-wei missed Emperor Wen. Bao sent Hsi-wei back to Mr. Chen to fetch straw from his late-wheat harvest. The sun was down when he returned, and Mrs. Huan prepared a dinner of rice with bok choy, mushrooms, and some dried pork. Mei made a pot of tea of which she was quite proud. The meal ran late because the Huans had so many questions. It seemed to them that the guest who had come from nowhere had been everywhere. Mrs. Huan was amazed that he had lived in the old capital of Chang’an when it was still known as Daxing and had also visited the new one, Luoyang. She wanted to know all about both. How wide were the streets? Had he seen the Rotating Pavilion? What were the Buddhist temples like—simple or very grand? Did all the people in the capital dress in silk? Were the women as haughty as they were said to be? He had trekked through the southern provinces and climbed the Yellow Mountains. He had visited the Grand Canal and had even seen the ocean. Bao refused to believe that he had really been to all these places; yet she had more questions than either her mother or her little sister. Hsi-wei was glad to answer. He described the new temples erected by Wendi and the old Buddhist monastery at which he had stayed. He told them how poverty and wealth pushed up against each other in the cities and how the countryside suffered through ferocious droughts and relentless floods. Mei wanted to know more about Hsi-wei himself. What adventures had he had? Hsi-wei obliged by telling her a few of his experiences, and Mei, her eyes shining, begged for more stories. He never mentioned his poetry or how the little fame they had won him led to his being well received in this or that province. It delighted him, as it always did, to be among good people who knew nothing of his writing and took him for what he truly was—a vagabond peasant who, as a boy, had learned the craft of sandal-making from an uncle. It grew late and Mei began to yawn. “And to repair that leak,” Bao reminded him. “Oh, please let him stay, Mama,” pleaded Mei. Enthralled by his stories, she hoped to hear more. Mrs. Huan agreed with a smile and told the drowsy child to go to bed. Bao reminded Hsi-wei about the repair to the roof. 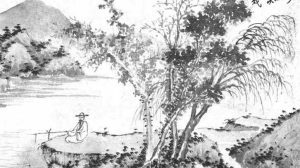 Hsi-wei had heard at least a dozen versions of the story of Xingyun. The tale had been circulating for years. It had to date from early in the rule of Emperor Wen since it involved two of his earliest reforms. Hsi-wei had noted that, wherever the story was told, the teller always placed the village of Xingyun in some distant province. As Mei was sure it was in Liangzhou, the people of Liangzhou were just as certain the village was in Ba-Han, while the peasant from whom Hsi-wei had heard the story in Ba-Han situated the village in Henan. Hsi-wei thought that perhaps there was some truth to the story of Xingyun but, over time, it had become a legend, a folk tale of pluck, peace, hope, and justice, just the kind of story to appeal to children like Mei. According to all the versions of the story Hsi-wei had heard, the local prefect—whose name could be Fung or Chang or Shui—was one of the old sort, nephew of a local landlord, cruel, biased, quick to demand a bribe. His family had held the position for generations. When the order came from the capital to begin conscripting peasants and increase their taxes, this Fung or Chang or Shui threw himself into the work, anticipating a rise in graft to match the one in taxes. It was also an excellent opportunity to rid himself of malcontents. Those out of favor or who could not pay were taken away, men and women alike, until many villages in the region were left with only young children and elderly grandparents. At the same time that Emperor Wen ordered the conscriptions, he began the process of standardizing the Empire’s currency. He had five mints built in various provinces to strike the new Wu Zhu coins. In accord with a schedule worked out in Daxing, armed convoys would be sent out from these mints to distribute the new coins through the Empire and to confiscate the old, privately minted ones. It was estimated the task would take two to three years to complete. Conditions in the prefecture run by Fung, Chang, or Shui were particularly harsh. Young men stole away before they could be conscripted. Some went to relatives in other jurisdictions; others became bandits. Some versions of the story include the unlikely exploits of the young bandits. Whether they are kidnapping the prefect’s son and teaching him to despise his father, stealing pigs from the prefect’s family compound, or outsmarting Turkic mercenaries, the outlaws are always presented as clever, down-to-earth, decent heroes who enjoy the sort of camaraderie that is irresistible to children, especially if the heroes are children themselves. In some versions, the bandit gang includes women who are just as brave and clever as the men. The bandits are always young, healthy, witty, and indifferent to the risk of torture and beheading. Hsi-wei recognized all these bandit stories as elaborations, digressions to please the public, but distractions from the story’s proper subject. The tale really begins when bandits ambush an armed convoy carrying the Emperor’s new Wu Zhu coins. After a short, sharp fight, the outlaws kill the officers and drive off the guards. All this is witnessed by four ragged but fascinated children who are foraging for mushrooms and happen to be at the side of the road. Three of the bandits take hold of the children and warn their leader. Some of the bandits objected and the captain let them speak. But once they were done, he made a short speech. In the morning, Mei sat watching Hsi-wei work at the sandals. “Never heard of it,” he said. The poet pretended not to know the story so that Mei could have the pleasure of telling it to him. Mei said her favorite part was when the four children arrived in the village of with the casket full of bright new coins. They shouted, “Good news! Good news!” And everybody came out to see, young and old. The littlest children jumped up and down and clapped their hands. “But everyone was very thin,” said Mei seriously. Hsi-wei saw no need to point out that Mei and her sister were hardly fat. “So, the children told everything that happened—the looking for mushrooms, the attack on the convoy, the bandits grabbing hold of them and then how their captain gave them the casket of money to bring back to Xingyun. All versions of the story agree that, when he heard about the casket of coins in Xingyun and how they had come to be there, the prefect ordered a detachment of cavalry to place the children of the village under arrest. And this was done. They were taken to the local capital, put in jail, and would have suffered hunger and cold if the local women had not taken pity and brought food and blankets. A date was set for the trial. Everybody was sure the prefect, who had been unable to recover the shipment of coins or find the bandits, would impose the most severe punishment on the children. But then something unexpected happened. In accord with his reform of the civil service, Emperor Wen sent out a new prefect who took over just days before the trial of the children. The deposed prefect was furious but could do nothing except to insist that his successor, who knew so little of the region and its problems, permit him to prosecute the thieves who had stolen the Emperor’s new coins. The new prefect, who had been well informed as to the character of his predecessor, courteously agreed, and the trial went forward as scheduled. Mei’s second favorite part of the story was what happened next. The new prefect courteously thanked his predecessor for so forcefully presenting the prosecution’s case. He then turned to the four children and, in a tone that was not unkind, asked if they could defend themselves. The oldest child (in Mei’s version, it was a girl) spoke up in an even, clear voice. “Go on,” said the new prefect with an encouraging smile. The child stood up even straighter and looked bravely at the new prefect, a man who may have seen the Emperor himself, who may even heard his voice, a man of real authority, come from the Imperial capital. “Just this, My Lord: if we have stolen from the State, what has the State stolen from us? What have we children lost because of the Grand Canal and the Great Wall and the war in the south and the ones north? What has the Empire stolen from us, My Lord? Hasn’t it taken our parents, our aunts and uncles, our cousins, our rice, our future, our hope. . . .” The child broke off, overcome. It was the next day when the prefect announced his decision. So many gathered to hear it that the reading of the verdict had to be moved to the marketplace. “The cheering was loud and it lasted a long time,” declared Mei with satisfaction. Planted with peonies for springtime and chrysanthemums for fall. Chrysanthemums in autumn, and rice the whole year through. For a larger house, for water gardens, and thicker walls. Of loved exiles. Huan Mei, who wouldn’t wish to visit Xingyun?